USGS photograph (used with permission) from Mt Saint Helens. It reveals multiple layers of strata that had been laid down rapidly or simultaneously, and with buried trees within the strata. Thus, individual strata do not necessarily require significant gaps of time between formation of the layers, and large trees can be catastrophically buried rapidly and not just gradually settling in the mud. 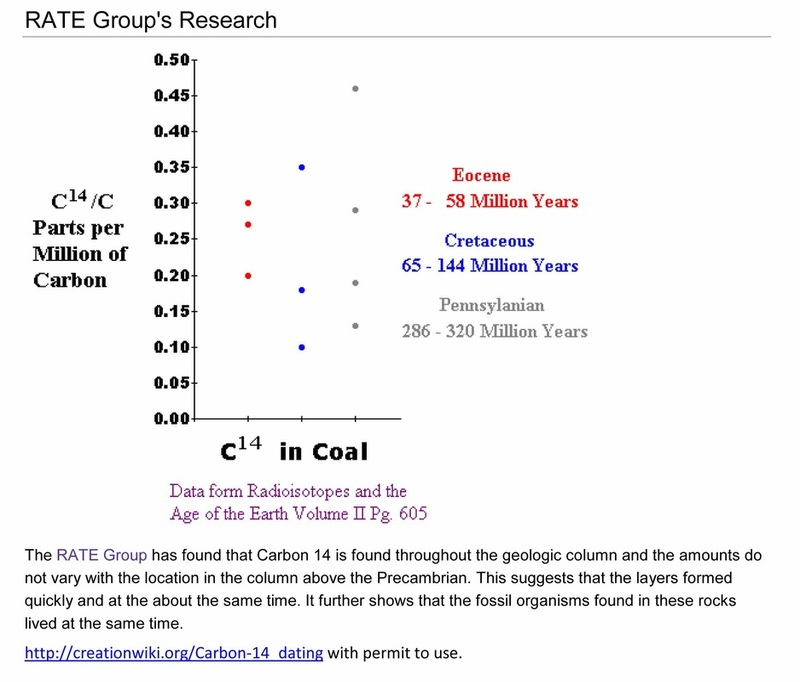 "Given the short 14C half-life of 5730 years, organic materials purportedly older than 250,000 years, corresponding to 43.6 half-lives, should contain absolutely no detectable 14C. (One gram of modern carbon contains about 6 x 1010 14C atoms, and 43.6 half-lives should reduce that number by a factor of 7.3 x 10-14.) An astonishing discovery made over the past twenty years is that, almost without exception, when tested by highly sensitive accelerator mass spectrometer (AMS) methods, organic samples from every portion of the Phanerozoic record show detectable amounts of 14C! 14C/C ratios from all but the youngest Phanerozoic samples appear to be clustered in the range 0.1-0.5 pmc (percent modern carbon), regardless of geological ‘age.’ A straightforward conclusion that can be drawn from these observations is that all but the very youngest Phanerozoic organic material was buried contemporaneously much less than 250,000 years ago. This is consistent with the Biblical account of a global Flood that destroyed most of the air-breathing life on the planet in a single brief cataclysm only a few thousand years ago." "The apparent age of the time dilated universe: Explaining the missing intracluster media in globular clusters"
"In creation time dilation cosmologies (e.g. Humphreys and Hartnett), while the earth experiences less than 10,000 years of recorded history (God’s time clock), millions, and possibly billions, of years pass in the distant universe...According to these considerations and to Scripture, the apparent age of the cosmos is much lower than the ‘astronomical’ age assumed by the cosmologists: 'For in six days the LORD made heaven and earth, the sea, and all that in them is, and rested the seventh day'” (Exodus 20:11)." Article from Creation Ministries International online 4-24-15. Living Fossils are an oxymoron. They are not to be expected if evolution and the supposed selective pressures assumed to produce grossly different structures has and is occurring. 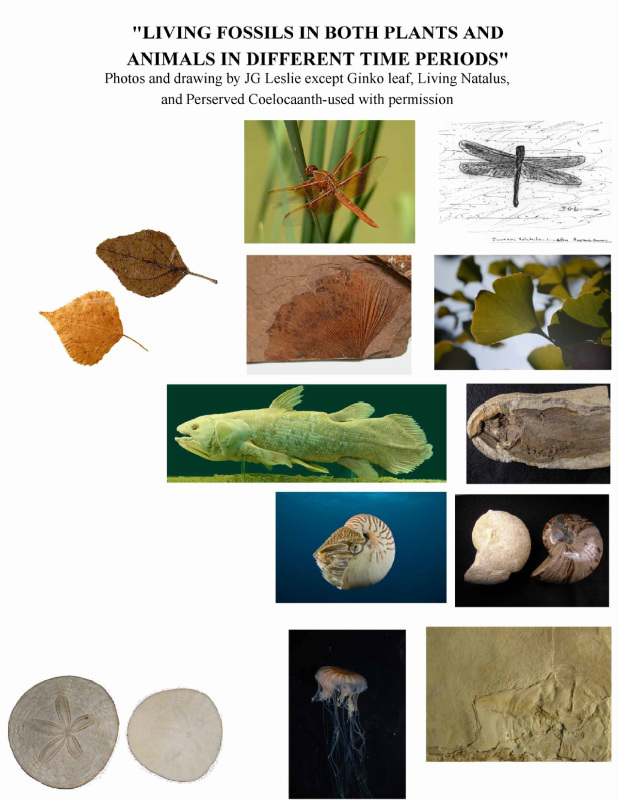 In the first row is living dragonfly virtually identical to a fossil one-from the designated Triassic Period. It is assumed, by evolutionists, that the Triassic strata are 200-250 MYO. The 2nd row includes a fossil Gingko leaf designated Eocene Period and assumed 50 MYO. (Permit from Wikipedia User:SNP CCA 3.0) And there is a living Gingko leaf. In the 2nd row to the left is a fossil and a living deciduous leaf. The type is unknown to me, but deciduous fossil leaves are found in the designated Cretaceous Period, assumed to be 160 MYO. In the 3rd row is a fossil Coelocanth and a recent living but preserved one. The fossil picture is from an unknown strata, but other fossils are known to come from the designated Jurassic Period assumed to be 165-`145 MYO. (Permit to use pereserved one from Wikipedia Alberto F Fernandez CNU 1.2). The 4th row shows a living and two fossil nautiluses-preserved under different conditions. (Permit to use the living nautilus photo from Mark Spencer-please do not reproduce.) Fossil nautili have been found in the designated Cambrian, assumed 500 MYO. There is a great variety in shapes from straight to curled-but all with the basic structure of chambers. The 5th row has a living jellyfish and a fossil one.The oldest jellyfish have be purported in designated Cambrian strata assumed 500 MYO, and virtually unchanged to the living ones. Sand dollars are both fossil and living ones, to the left 5th row. Fossil sand dollars are found in designated Paleocene strata, assumed to be 60 MYO. The fossil one is to the left of the recent living one's exo-skeleton. There should be no "Living Fossils" according to evolutionary concepts, but there are. But these are reasonable observations to be placed within the concept of a recent worldwide flood. Please note that I listed the time periods as "designated" and ages as "assumed".This was done so the reader would understand that I do not accept these concepts, but use them to show the supposed vast periods of time, if they were true, in which there would have been no evolution of these examples representative of many "Living Fossils". This is strong observable evidence against evolution. See article below for more information on Living Fossils. 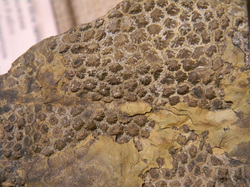 ﻿#1﻿ Fossil Dinosaur Skin-consistent with rapid burial and preservation of sift tissues of animals. ﻿#2﻿ Very little sediment on the sea floor; ﻿#3﻿ Bent Rock layers (see pictures on this website); ﻿#4 ﻿Faint Sun Paradox; ﻿#5﻿ Rapid Decaying Magnetic Field; ﻿#6﻿ Helium in Radioactive Rocks; #7 Carbon-14 in fossils, coal, and diamonds; ﻿#8﻿ Short-lived comets; ﻿#9﻿ Very little salt in the sea; and ﻿#10﻿ DNA in 'Ancient' bacteria. Picture by JGL of fossil dinosaur skin at the Museum of Natural History NM.Please do not download. Sequoiadendron giganteum (giant sequoia Giant sequoias are the world's ﻿largest single trees﻿ and largest living thing by ﻿volume﻿. Giant sequoias grow to an average height of 50–85 m (164–279 ft) and 6–8 m (20–26 ft) in diameter. 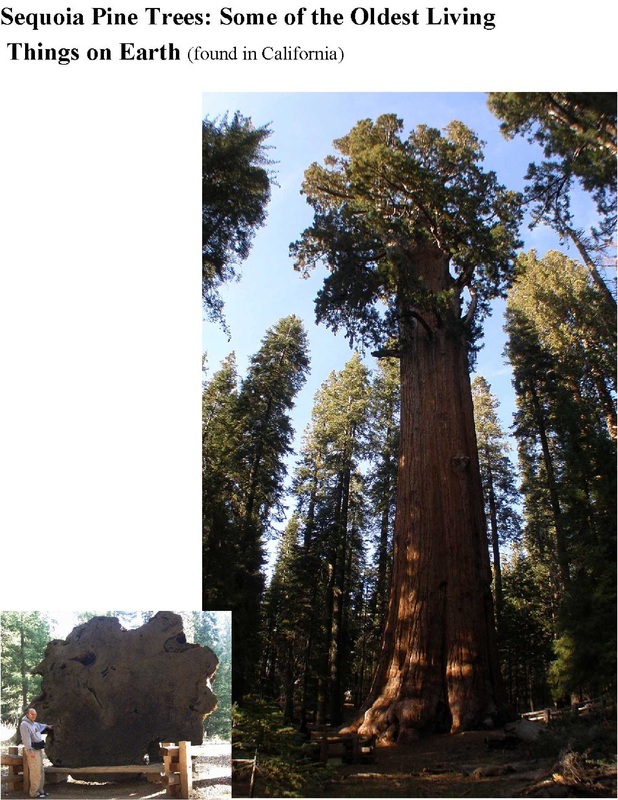 Record trees have been measured to be 94.8 m (311 ft) in height and over 17 m (56 ft) in diameter.The oldest known giant sequoia based on ﻿ring coun﻿t is 3,500 years old. Giant Sequoias are among the oldest living things on Earth. It should be noted however, that tree ring dating is problematic and is best used in comparing ages of different human artifacts where at least one of them has been associated or correlated with written artifacts. The relative times of different sites of archaeological housings with timber construction can often be compared. But all this is useful only within a few hundred to thousand years. The Bristlecone Pine (representative below) is thought to be the oldest at 4,600 years old. Again, there is some extrapolation of data in that it is assumed that only one tree ring developed per year which would require a consistent constant cycling of the seasons-as rings are affected by climatic changes. If correct it would argue for a short time since the Noah Flood Event, after which all plant life would have had to begun regrowing. However, 4000-5000 years would be reasonable for the length of time from the worldwide Flood of Noah and present time as presented by the Bible. The correlation of some fossil forms of pines with living ones (or recently dead) would only argue for these possibly being "living fossils"; that is trees growing before the Flood, and consistent with burial of the trees during Noah's Flood and not necessarily a greater antiquity of the trees. (The elongated ages are due to certain assumptions regarding the dating of strata the fossils are found in, and is estimated at 40 million years-see R. M. Lanner "The Bristlecone Book" page 16.) The trees are growing on sedimentary rock composed of limestone "fossil shells and skeletons of marine animals" per a park display. It, the Reed Dolomite, gives the mountain a whitish appearance and thus may be part of the reason for the name "The White Mountains". Sequoia and Bristle-cone (from California) photos by JGL. "It has been found that all trees, even slow-growing ones, respond dynamically to tiny environmental changes, even hourly changes in growing conditions. Scientists have observed that numerous “normal” conditions can produce an extra ring or no ring at all. Weather was fingered as the most “guilty” culprit. Unusual storms with abundant rainfall interspersed with dry periods can produce multiple rings, essentially one per major storm. Thus, the basic assumption of tree ring dating is demonstrably in error. Can we trust the overlapping calibration curves?..." "The great ages claimed for certain individual Bristlecone Pine trees (Pinus longaeva) and the Bristlecone Pine master-chronology, conflict with biblical earth history. The ages, however, are based on the assumption that the trees grew no more than one ring per year. 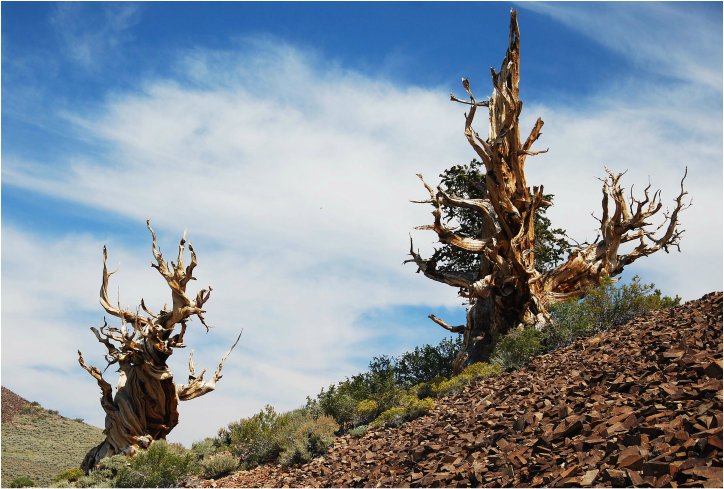 Creationists have proposed that these supposed old Bristlecone Pines (BCPs), including the ones that make up the master-chronology, have grown more than one ring per year. If these trees did grow more than one ring per year, the conflict between the ages of these trees and the biblical record is resolved. This paper compiles and examines some of the evidence for multiple ring growth per year in Bristlecone Pine..."
"Recent research on seasonal effects on tree rings in other trees in the same genus, the plantation pine Pinus radiata, has revealed that up to five rings per year can be produced and extra rings are often indistinguishable, even under the microscope, from annual rings. As a tree physiologist I would say that evidence of false rings in any woody tree species would cast doubt on claims that any particular species has never in the past produced false rings. Evidence from within the same genus surely counts much more strongly against such the notion. Creationists have shown that the biblical kind is usually larger than the ‘species’ and in many cases even larger than the ’genus’..."
As well, it should be noted that the precursor/product ratios of any of the radioactive series is unknown and will never be known-it is a past event not measured by man. JGL comment. If a much wetter ice age climate were taken into account, growth rates would have been even faster, since varnish in these environments can grow one to two orders of magnitude more rapidly than the slow rate assumed for deserts. In other words, any rock varnish seen on the surface of the earth can form in the time since the Flood! Rock varnish is no longer a ‘contradiction’ to the short timescale of the Bible..."
See below link for full report. Photo of desert varnish on metamorphic sandstone is from Bristlecone National Park, White Mountains CA. Photo by JGL. Dr Mason does a tremendous job responding to Dr Payne's presentation in which he,Payne, defends long ages of the earth to a group called "Reasonable Faith Adelaide". Dr Richard Lewontin, an evolutionary biologist at Harvard, has summarized this situation very well. “…The RATE team concluded that although approximately 1.5 billion years of U/Th decay at today’s decay rates occurred within the GT-2 borehole rock, helium generated by that decay had only been escaping for about 5,700 years, which is why large amounts of helium were still present in the zircons. This discrepancy can be resolved if there was a time in the past in which nuclear decay rates were much higher. This is strong observational evidence that at some time in the past, accelerated nuclear decay did occur…RATE zircon/helium measurements showing only thousands of years provide powerful evidence for recent creation.” See link below.